Voters turn out to cast their ballots at a polling station Nov. 4, 2014, in Westport, Conn. This year marks the 50th anniversary of the signing of the Voting Rights Act. The anniversary follows the release of Ava DuVernay’s film Selma, which documents the movement that gave birth to the VRA. In scene after scene, the film reminds us just how vehemently whites openly opposed equal voting rights for all. Today, however, thanks to the work of Martin Luther King Jr. and other civil rights advocates, laws are on the books guaranteeing equal access to the ballot box, regardless of skin color. Yet, 50 years after the events of Selma, equal access to the ballot box is in grave peril. We may no longer hear biases expressed as openly as in the days of Selma, yet racism continues to haunt the voting process. In recent years we have seen a terrifying trend across the country as states pass laws making it more difficult for minority and other marginalized voters to cast their ballot. Restrictive photo-identification laws have passed in at least 16 states, even though African Americans are less likely to have photo ID (pdf). 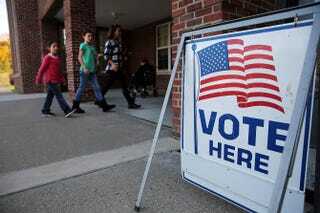 Early voting, which African Americans do at higher rates than most voters, is being cut. Restriction after restriction is making it harder to vote. But restrictive voting laws are not the only factor affecting minority voters: Implicit bias may also play a role when an election official is assessing whether a person satisfies voting requirements. “Implicit bias” is a psychological term referring to unconscious negative associations. Although we like to think we control our decisions, we have conscious access only to about 5 percent of our brains, meaning that much of how we think, feel and act is determined at the unconscious level. This means that a person can consciously reject racism but still be unconsciously influenced by stereotypes. This isn’t a problem affecting just a few of us, either: Research shows that the majority of Americans hold some degree of implicit racial bias, even though 85 percent of Americans consider themselves to be unprejudiced. Although voting laws are fairly detailed, poll workers and other election officials must still make numerous decisions in the days leading up to Election Day and on Election Day itself. As social psychologists have shown, relying on a person’s discretion opens the door for unconscious biases to taint the decision-making process. Numerous experiments have established the impact that implicit biases have on decisions in a range of areas, from employment (pdf) to schooling to health care (pdf). For instance, one study found that job candidates with “ethnic-sounding” names (such as “Lakisha”) were half as likely to be invited in for an interview as candidates with “white-sounding” names (like “Jane”), even though the only difference on the application was the name of the candidate. Another study showed that professors replied more often to students’ requests to meet with them when the request came from students with generically “white-sounding” names than when the names were associated with minorities. If job recruiters, college professors and doctors are all influenced by implicit biases, why would election officials and legislators be any different? My name is (voter NAME) and I have heard a lot in the news lately about identification being required at the polls. I do not have a driver’s license. Can I still vote in November? Thank you for your help. The experimenters changed the name in the email so that one group of legislators received the email from a “Jacob Smith” while another group received the email from “Santiago Rodriguez.” Because no state requires a driver’s license to vote, the answer should have been fairly simple, but that is not what happened. The researchers instead found that legislators supporting voter-ID laws were more likely to answer an inquiry from “Jacob Smith” than from “Santiago Rodriguez,” providing strong evidence that voter-ID laws were enacted based on discriminatory intent. But the study also reveals that implicit bias may influence the voting process, even when the intention is to treat everyone equally. The study noted that even those legislators who did not back photo-ID laws (for instance, many Democrats) responded at a different rate depending on the perceived ethnicity of the voter. Other studies also reveal the possible role of implicit bias in poll workers’ Election Day decisions. A 2008 survey (pdf) found that, even after controlling for differences in state-ID laws, African-American voters were significantly more likely than white voters to be asked to show photo ID. In fact, 70 percent of African-American voters were asked for photo ID, while only 51 percent of white voters were. Martin Luther King Jr., John Lewis, Annie Lee Cooper and countless others put their lives on the line in Selma, Ala., to fight racism in its most explicit, ugly forms in order to secure equal voting rights. Today the challenge is not over: Advocates must fight to counter voter suppression in all its forms, both explicit and implicit. A. Gordon is a civil rights attorney in Washington, D.C.